American artist Julia Heyward, contemporary of Gordon Matta-Clark, will perform and screen select works from her interdisciplinary practice. This event is organized by Elisa R. Linn and Lennart Wolff. Since the early 1970s, Heyward has explored language through live performance, photography, film and video and interactive digital works. Heyward employs a variety of vocal techniques, musical styles, and visual spectacles in her work. Her films and performances draw on personal biographical narratives, childhood trauma and themes of faith and spirituality as well as larger societal issues, among them class and gender inequality and environmental rights. Click here to RSVP though Eventbrite. Julia Heyward, Cover for the video prototype “360,” ca. 1978-1980. Photo courtesy of the Artist. Julia Heyward (b. 1949, USA) lives and works in New York City and is a graduate of the Whitney Independent Study Program. Also known as Duka Delight, she was a major figure in the city‘s downtown performance art scene during the 1970s. 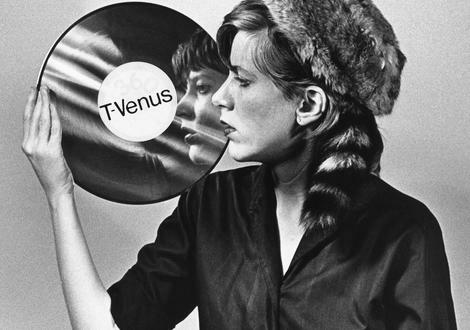 During the 1980s she was involved with the No wave scene, both as a member of the band T­Venus and as producer and editor of several important music videos, including Talking Heads’ Burning Down the House (1983). Throughout her career she has collaborated with artists and musicians, notably Ericka Beckman and Laurie Anderson, and her work has been cited as a major influence by artists such as Mike Kelley. Heyward has been nominated for and granted several prizes and stipends including the inaugural New York Dance and Performance Award, also known as the Bessie, in 1984, the Guggenheim Fellowship in Multimedia in 1999, as well as awards from the Rockefeller Foundation, The Greenwall Foundation, the New York State Council on the Arts, and the National Endowment for the Arts. During her 30 year long career, her works have been widely exhibited, with recent shows at MoMA (2016), Redcat Los Angeles (2016), Künstlerhaus Stuttgart (2015) and Whitney Museum of American Art (2013). In 2015 she was the subject of the retrospective exhibition Conscious Knocks Unconscious at The Wattis Institute in San Francisco, curated by Jamie Stevens. Recent works, such as the panoramic 29 SpaceTime (in collaboration with Perry Hoberman), employ digital and interactive technologies that fuse stage performance with projection. Elisa R. Linn is a curator and writer based in Berlin and New York, where she is currently attending the Whitney Independent Study Curatorial Program. Her writing has appeared in publications and magazines including Frieze, Spike Art Quarterly, Kaleidoscope and Artforum. Together with Lennart Wolff she has founded the curatorial project km temporaer. Current and upcoming projects include performances, screenings and exhibitions at galleries, independent spaces and institutions such as Galerie Bernhard (Zurich, 2017), Shoot the Lobster (NYC, 2017), Neuer Aachener Kunstverein (Aachen, 2015), 83 Pitt Street (NYC, 2016), British School at Rome (Rome, 2018), South London Gallery (NYC, 2018) as well as the Center for German Architecture (Berlin, 2018). Lennart Wolff is an architect and curator based in Berlin and a graduate from the Architectural Association London. Together they founded the curatorial project km temporaer. Current and upcoming projects include performances, screenings and exhibitions at galleries, independent spaces and institutions such as Galerie Bernhard (Zurich, 2017), Shoot the Lobster (NYC, 2017), Neuer Aachener Kunstverein (Aachen, 2015), 83 Pitt Street (NYC, 2016), British School at Rome (Rome, 2018), South London Gallery (London, 2018) as well as the German Center for Architecture (Berlin, 2018).